This article was originally published on the Drug Reporter website. Drugreporter’s team attended the UN Commission on Narcotics Drugs (CND), please read some take home messages and watch some videos we produced there! Drug-free World: Reloaded. This was the title we gave to our video report about the 2009 Commission on Narcotic Drug meeting, when governments, despite of the evidence that their policies clearly don’t work, basically copy-pasted and repeated the 1998 political declaration. That is, they adopted another action plan to “eliminate or significantly reduce” drug use and trafficking in 10 years. I still remember the disappointment I felt: what is wrong with these people? This year I was not disappointed at all – everything went according to my expectations (I got older and more skeptical). The ministerial statement failed to draw conclusions from the evidence that they could not achieve any reduction in demand and supply and they reconfirmed their commitment to achieve a drug-free world. There were some strong, critical speeches at the opening, for example, the president of Bolivia defended coca legalisation again. But what we see is polarisation of opinions rather than linear progress. If you want to learn more about why the ministerial declaration is a disappointment, read this excellent statement from the International Drug Policy Consortium! Watch our video about how Jamie Bridge addressed the opening of the CND on behalf of the Civil Society Task Force! The big news last November was that the Expert Committee on Drug Dependence (ECDD) of the World Health Organisation (WHO) proposed the UN to reschedule cannabis from schedule IV (same class as heroin, with high abuse potential and no recognised medical value) to schedule I (low abuse potential, recognised medical value). This decision was made after the WHO conducted the first ever scientific review on cannabis. Yes, the first, because when cannabis was placed on the list of prohibited substances in 1961, this was not preceded with any scientific review. It is likely that this CND will not make a decision about WHO’s proposal because there are still many issues to be clarified – but this is clearly a historical step to the right direction. If you would like to learn more about cannabis rescheduling and its implications on global/national/local cannabis policies, watch this online video session we streamed from the UN Headquarters on Thursday! We also recommend you to read this report from the Transnational Institute! Unlike the CND, which reflects the consensus of member states, UN agencies are getting more progressive from year to year. In early March, right before the CND, the bosses of 31 UN agencies adopted a joint declaration in which, among others, they promote the decriminalisation of drug use. They “call for changes in laws, policies and practices that threaten the health and human rights of people.” Although several UN agencies adopted statements before in support of decriminalisation, this current one means that it is the official position of the whole UN family now. In addition to this statement, a task team that was created by the UN chief executives reviewed global drug policies and published a report. This report condemns punitive drug policies as “ineffective in reducing drug trafficking or in addressing non-medical drug use and supply.” This is a revolutionary statement in comparison with the dull ministerial declaration. There is an unprecedented number of civil society representatives in Vienna this year, with loads of side events organised by NGOs and several activists speaking at the thematic debates. This is clearly beneficial not only for civil society – but for the CND as well. Tons of expertise and knowledge is channelled to the sometimes rather dull conversations. But not everybody is happy with this change. Several member states still consider NGOs hostile forces who disturb the business-as-usual operation of the UN. In this they have the full support of the security staff of the UN HQ, which is a fossil from another historical age and treats civil society representatives in a disgraceful manner. Those governments that are responsible for gross human rights violations hate to be named and shamed publicly by activists. 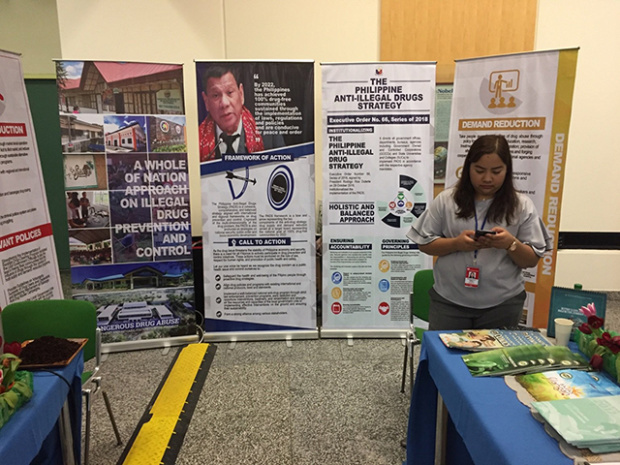 The government of the Philippines has a booth in the rotunda of the UN HQ with a huge poster with Duterte’s picture, praising drug policies of a country that murders thousands of people in the name of drug control. When activist organised a peaceful die-in action in front of the Philippine booth, the security intervened. Just like when Support. Don’t. Punish organised a joint photo taking outside the building. I think it is time for the UN to reform not only its outdated drug control system – but also its outdated rules and security procedures. The peaceful expression of opinion is not a threat to the UN basic principles but an exhibition praising mass murder is. We thank the International Drug Policy Consortium for supporting our work at the CND this year!